The quintessential Fall flavor has become a poster vegetable for Winter baking. 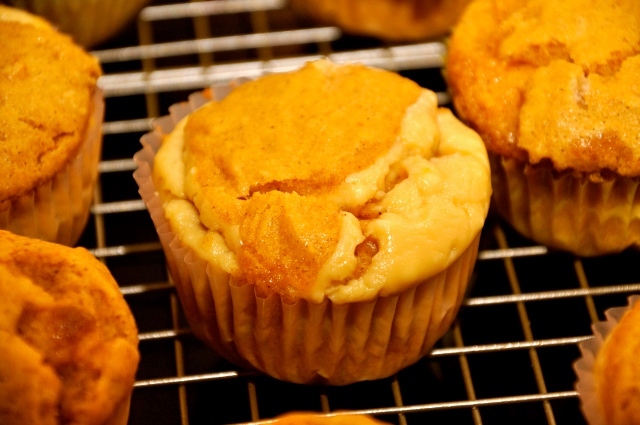 These pumpkin muffins are full of gooey deliciousness inside (so don’t think “mess” when you see “cream cheese filling”). Roasting and puree-ing the meat of a pumpkin is a time-consuming endeavor (I’m not speaking from experience); this is why Libby’s invented canned pumpkin puree. For the canned pumpkin, you can also substitute sweet potato. 1. Preheat oven to 375 degrees. Grease 18 muffin cups or line them with paper liners. 2. Filling: In a medium bowl, combine the cream cheese, brown sugar, egg, and vanilla. Beat until smooth; set aside. 3. Muffins: In a large mixing bowl, combine the flour, brown sugar, granulated sugar, baking powder, salt, and pumpkin pie spice. Add the eggs, pumpkin, oil, and vanilla. Beat until well blended. 4. Fill muffin cups about one-third full with the muffin batter, then put about 1 tablespoon of the cream cheese mixture in the center of each. Top with about 1 more tablespoon of the pumpkin batter, or until cups are about 3/4 full. 5. Bake for 20-25 minutes, until firm.